"We are Our Savior's family of believers welcoming all to share Christ's love, grow in faith and live a life of service glorifying God." Our Savior's Lutheran Church is a vibrant community of faith with a rich history, dedicated to moving boldly into the future together. 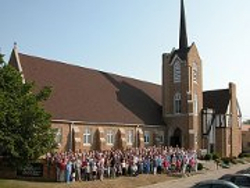 We want our Savior's Lutheran Church to be your place, your church, your family. We hope to be a community where you can grow in relationship with God and God's people. Opportunities exist for the young, the young at heart and everyone in between. We experience God's grace through music, conversations and laughter. We encourage each other and support each other through the good times and tough times in life. We share in God's work locally and globally. We are not perfect a community, but we trust God loves us and works through us anyway. Our Savior's was formally organized in 1882, as the community of Valley City was forming. Historically, we are a Norwegian Lutheran congregation. Sunday services were conducted in the Norwegian language until 1927. In 1955, Our Savior's received a bequest of two farms from the estate of George Mason, whose father Simon was a founding member of Our Savior's. The Farm Fund continues to allow us to give generously to partners in ministry. For example, the congregation gives regularly to Luther Seminary to provide scholarship assistance to students. We are a congregation of the Eastern North Dakota Synod of the Evangelical Lutheran Church of America. What does that mean? Learn more at the links below.